418. Buchanan & Righter’s patent slide-valve motion. Valve, A, is attached to lower end of rod, B, and free to slide horizontally on valve-seat. 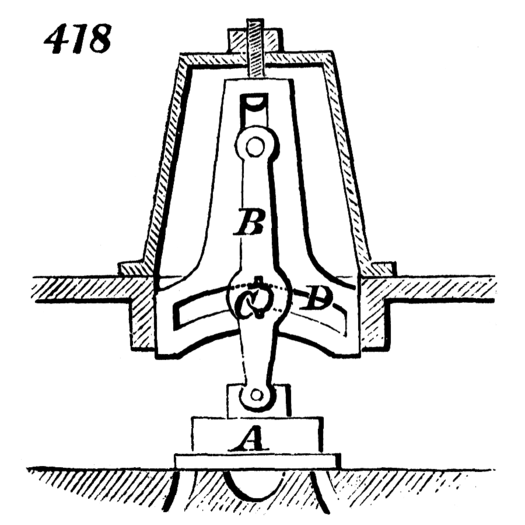 Upper end of rod, B, is attached to a pin which slides in vertical slots, and a roller, C, attached to the said rod, slides in two suspended and vertically adjustable arcs, D. This arrangement is intended to prevent the valve from being pressed with too great force against its seat by the pressure of steam, and to relieve it of friction.